Lennie Bush was born in 1927 at Shepherd's Bush in west London and was a childhood victim of polio which left him with a permanent limp. He studied violin as a youngster and moved to the double bass when he was 16. A year later was working the halls as a member of a variety act called The Rolling Stones and Dawn. He was at the Fullado Club, London in 1946, and a succession of club and dance bands followed including Carl Barriteau. Bush describes the Fullado Club: "It was a drinking club in New Compton Street mostly frequented by Africans and West Indians. In the evening they had a pianist who later became better known as a guitar player - Denny Wright. An african called Alec owned the club with a drummer called Arthur Aimey who always had his kit set up down there..." From early 1948 Bush toured regularly with the swing-style jazz trumpeter Nat Gonella's band, that included the emerging stars Kenny Graham and Phil Seamen. The arrival from America of the new bebop sounds in jazz coincided with Bush's arrival on the British jazz scene and he was a founder member of the legendary Club Eleven. From this Soho base came the first British bebop sounds. Lennie learnt a lot about adapting and listening to a soloist in these early years, learning how and where to put the notes and react to where the music was heading, vital skills for improvising musicians that are often felt rather than heard. Like others from this period he recalls the part played by Denis Rose and Carlo Krahmer: "You just got a general idea of what was going on from the records. We were all very young but Denis knew what they were doing and could tell us what was happening theoretically... he would teach people in an informal kind of way..."
From 1950 onwards Lennie Bush did an enormous amount of freelancing and was with Roy Fox in 1951. He joined Ronnie Scott in 1952 and stayed with him until 1956, and in 1957 began an eleven year association with Jack Parnell's ATV Orchestra. He continued to play jazz gigs and played with many top British musicians of the time including Tony Crombie, Victor Feldman, Dizzy Reece, Jimmy Deuchar, Tony Kinsey and others. Through the following decades Bush remained busy as both jazzman and studio musician, playing for films, television, theatre, commercials and albums. In the 1980s he spent eight years in the theatre run of Me and my girl as well as playing jazz gigs with, amongst others, Stan Tracey. During the 1990s he was often with Don Lusher's Ted Heath tribute band and played in the final Ted Heath concert in 2000. He continued to freelance in the 2000s often playing gigs close to his home in East Anglia until his death in June, 2004. He was also in demand with overseas jazz stars, touring with Benny Goodman several times in Europe, appearing with Louis Armstrong in London in 1956, and accompanying many others, including Zoot Sims, Roy Eldridge, Joe Pass and Stephane Grappelli. 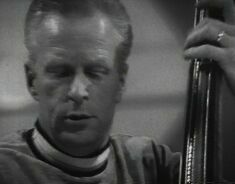 Following the death of Lennie Bush, John Dankworth said: "Lennie was there, and for half a century he occupied the throne as Britain's most senior bebop bassist." Many younger up-and-coming bassists came to listen, and learn. The veteran Spike Heatley commented: "Lennie was the most influential player in my early career. He was never flashy, and although his technique was unorthodox he could really drive and anchor a rhythm section. He could even make poor drummers play good time." I have not attempted to produce a full discography for Lennie because of the sheer volume of record dates he played on. Many details are available elsewhere on this website and I have supplied links to where much of this data can be seen. He recorded prolifically in the early years of the bebop/modern jazz era in Britain but from 1957 when he joined Parnell's TV band the jazz recording tailed off. As the jazz audience declined the musicians worked in the theatres and the commercial studios where their musical expertise found ready employers. 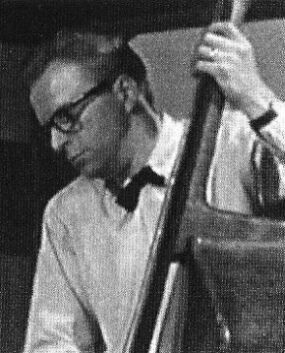 Although reckoned by many to be the premier modern jazz bass player of the 1950s it is interesting to note that he never recorded with Johnny Dankworth, Stan Tracey, Tommy Whittle or Joe Harriott, all major figures during the the period. The earliest Lennie Bush recording date that I can trace goes back to 1946 when he was playing with Nat Gonella's Georgians. This swing band included future jazz stars Kenny Graham and Phil Seamen. "I'd met Kenny Graham in Archer Street so he later roped me into Nat Gonella's band. My audition took place at the Aquarium theatre in Brighton and that's where I met Phil Seamen who had been virtually discovered by Nat. We were able to play jazz with the Georgians, then every now and again we'd do a week of variety. I did a few weeks at the Rex Ballroom in Cambridge, then started getting recommended for this and that. Kenny Graham was a very talented bloke... I remember a lot of the music he composed for Ted Heath... of course, he didn't get the encouragement and became very disillusioned towards the end." Nat Gonella, Monty Montgomery, Bruts Gonella, Fred Dinning (tp), Frank Osbourne (tb), Bertie King, Sandy Herd (as), Ronnie West, Kenny Graham (as,ts) Al Dallaway (p,arr), Roy Plummer (g), Lennie Bush (b), Phil Seamen (d). From February, 1951 to April, 1955 Lennie Bush worked with Ronnie Scott and appears on almost two dozen Ronnie Scott recording dates from this period including Boptet, Quartet, Quintet, Jazz Group and Orchestra. The Orchestra was Ronnie's incredibly successful nine piece band and the story of this band is detailed elsewhere - Orchestra - recording details for the other dates: Ronnie Scott. Of the nine piece band formed in 1952, Lennie said: "It seemed to be a really good time to get a band together. After Tony Crombie left, Phil Seamen joined us from Parnell then Jimmy Deuchar was lured away by Cyril Stapleton. Hank Shaw became the trumpet player - it was OK but not really the same and Ronnie got fed up with it so we busted up that band and Ronnie went on to his big band. I was not in that I had joined Tony Crombie..."
From March, 1955 to July, 1958. Bush worked with Tony Crombie and took part in recording sessions with varied Crombie groups including a combined Ronnie Scott / Tony Crombie band. "Tony Crombie could write and wasn't a bad pianist either". Recording details for the Crombie record dates: Tony Crombie. Victor Feldman - April, 1951 to January, 1957. Lennie Bush had a recording association with Victor Feldman, from 18th April, 1951 with Tommy Pollard's Downbeat Five through to January, 1957 when Victor recorded his last big band titles for Tempo before he emigrated to the USA. The pair worked on many recording dates, mainly for Esquire with groups varying in size from a duo to a big band. Many of the Feldman dates featured the talented but wayward pianist Tommy Pollard: "Tommy Pollard was a wonderful pianist. He and Victor Feldman used to get on - they'd play things together that were a bit 'outside', improvising completely. Tom could do that - he had a great ear and could play anything he heard". Recording details for the Feldman record dates: Victor Feldman. Tubby Hayes (ts, fl), Jimmy Deuchar (tp), Bill Le Sage (p,vib), Lennie Bush (b), Tony Kinsey (d). Weber The Great*#/Girl In Blue#/World Of Blues#/Bassman*#/Beathaven*#/What A Gas*#/Runnymede Groove*#/Portrait*#. This page was last updated during July, 2011.